This secluded, three double bedroom, 18th century house has enclosed, very private, walled gardens and pool. Surrounded by vineyards it lies about 1.5 km from the village of Cairanne (its wine is Cru du Cotes du Rhone). The beautiful Roman town of Vaison-la-Romaine with its famous market is a 15 minute drive away. Other famous Provencal towns, such as Avignon, Aix-en-Provence are easily reachable.The garden is well equipped for outdoor living with an 8x4 pool, outdoor shower, sun beds, barbecue and outdoor dining furniture. Surrounded by beautiful mature trees, it has sun right through the day - well into late afternoon and early evening. You can be in good sun or good shade, depending on individual taste. The interior is well-equipped, simple and stylish. Cooks will love the kitchen which is exceptionally well-equipped. This property is an ideal combination of great location, usable outdoor space and comfortable interior. It has a wood burning stove, good central heating and double glazing - ideal for a cosy off-season holiday/wine-tasting break. Check out our 5 star reviews! Mike and Mark.We are both British, but we have lived in Amsterdam for the past 20 years. Mike has recently retired. Prior to that, most of his career was spent in the British higher education system. Mark has had a long career in fashion retail. Prior to moving to Amsterdam we lived in northern England. We have both travelled extensively in Europe, North America and Asia as part of our professional lives as well as for holidays. Over the last few years we have holidayed in Provence quite frequently and grown to love the region for all the obvious reasons: Climate. Countryside. Food and Wine. Outdoor Activities. Historic Towns and Villages. The house is not overlooked and the garden and pool are very private. In the long term we may well live permanently in this house. For the time being, we are sharing our time between Amsterdam and Provence and we are pleased to rent the house out when we are not there. We fell in love with this property at first sight. It seemed to tick all the boxes for us. The character/location of the house is typically rural but that is combined with an interior which meets our tastes in terms of good design. A fussy "Provence country cottage" look would not be to our taste. Le Mas du Bourellier is light, airy and stylish with a high level of attention to detail. The garden is completely enclosed, which is in unusual in these parts; ideal for those with small children or dogs. There is secure parking and there are vines growing on all sides. The view of the mountains is spectacular. The village of Cairanne is really close and has everything you need on a daily basis. Only 5 minutes away there is a fuller range of shops. We love the wide range of local markets. There is one every Saturday in St. Cecile and most days of the week have a market somewhere if you are willing to travel a bit. Large bathroom on ground floor with beautiful roll-top bath and separate shower. Separate toilet next to bathroom. En-suite toilet in bedroom 1. Solar-heated outdoor shower at side of pool. Very efficient oil fired central heating system for all parts of the house. The house is also fully double-glazed so well suited for winter use. Good supply of towels both for indoor and poolside use. Open plan, tastefully renovated with character archways and lovely tiled floor. Comfortably but simply furnished in tune with the character of the house. Wood-burning stove, satellite television, internet WiFi, DVD player, iPad speaker. There is a fridge in the kitchen and a fridge-freezer in the adjacent area. There is a fridge-freezer in the area adjacent to the kitchen. Hob has three gas burners. The dining area lies between the kitchen and the living room. It is finished with a round oak table which seats up to a maximum of nine people. There is also an oak sideboard. Television on Freesat system - provides most UK stations and also UK radio stations. Good choice of board games and playing cards. Sorry to say the house is not really suitable for anyone with significant mobility problems. All the bedrooms are upstairs. Please consult the owners if you have slight mobility problems. Notes on accommodation: TV is by Freeview satellite. This means you can get all UK stations. Perhaps more important, the system also receives all BBC radio stations, including Radio 4. (We realise that some of our guests, just like us, cannot live a day without this lifeline - even when on holiday.) An iPod dock is provided so you can play your own music (or words). There is also a good quality DVD/Blue-ray player. So there is a great selection of in-house entertainment in the unlikely event of your not wanting to go outdoors. Outside: The private swimming pool is 8x4m. It is directly adjacent to the french windows at the back of the house and surrounded by a paved area. There are 6 sun beds and a solar- heated outdoor shower. The garden is completely enclosed by walls and hedges and very secluded. It is full of mature vegetation. There is a pergola at the back which is covered by vines - very necessary in the hottest months. There is outdoor dining furniture for 6 people and a sturdy barbecue. From the rear of the house (by the pool) there is a splendid view of Les Dentelles de Montmirail - our local mountains. They look great all the time but sometimes at sunset they are breathtaking. Utility Room: Separate utility room contains central heating boiler and a top-loading washing machine. Iron and ironing-board. Indoor and outdoor drying facilities. Cleaning / Towels / Linen / Maid service: The house is fully stocked with bed linen, indoor towels and pool towels. It is thoroughly cleaned at the beginning and end of each letting period. There are local caretakers. Extra cleaning (and support) services can be arranged for an extra charge. Very glad you liked the house so much. Yes it was really hot when you were there. We have now added some more extra powerful (but quiet) fans to help with the cooling process. Superb place for a relaxing peaceful break. The house is really comfortable and superbly well laid out, with a shady sitting area for long lunches and dinner beside the pool. Set amidst the vineyards the only sounds you can hear are the cicadas, yet it’s still a very short cycle or drive from Cairanne for bread and essentials at the wonderful local epicerie. We have loved our second stay here just as much as our first. A tastfully furnished, well looked after property for a perfect relaxing holiday. Situated in the middle of vineyards an hour away from Avignon and a whole host of top quality Roman remains made for the most relaxing of holidays. The villa is well kitted out & comfortable, the small garden area is well fulrnished and the pool delightful. And the light in Provence - just beautiful. We adored staying in this stunning house for two weeks. It was absolutely perfect for our family of five, with a wonderfully-equipped kitchen, comfortable beds, stunning outdoor entertaining areas, seclusion and tasteful furnishings. We were very close to some beautiful towns in the Vaucluse department, including Gigondas, Seguret, Rasteau and of course Cairanne very close by. We also found Orange, Avignon, L'ile sur Morgue and the Luberon to be within easy reach. And we spent plenty of time relaxing at home in beautiful surrounds, and walking amongst the vineyards. 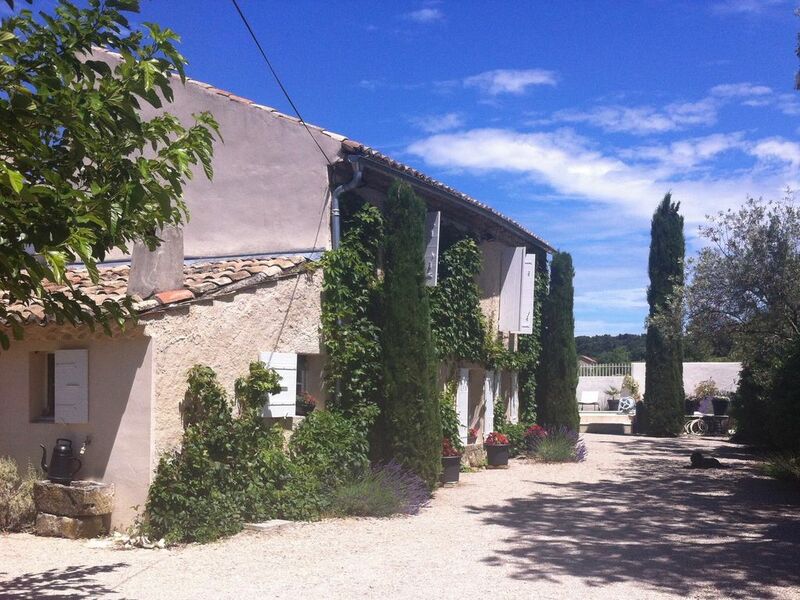 We would highly recommend this property to anyone seeking a unique and unforgettable Provence experience. Stayed for 2 weeks and wish we had stayed a month! This is a well cared for villa, fully equipped for a family holiday. It is extremely quiet being away from the local village, but near enough for a morning visit to the bakers for breakfast. Right in the middle of the wine area, it is ideal for a visit to Gigondas (our favourite) as well as Sablet and Beaumes de Venise. We can thoroughly recommend a vacation here. Arrived home last week after a very relaxing holiday in a lovely property perfectly situated amongst endless vineyards. We travelled down to Cairanne by car from Calais and then picked up our daughter, grandaughter and her friend from Avignon Airport. The holiday was thoroughly enjoyed by us all and no one wanted to leave. The house has everything you could wish for and so very well cared for. Mike was a great help and very responsive to our needs. It's a holiday none us of will forget and I would certainly recommend it to anyone looking for a week in Provence. This is not a coastal area. The nearest (sea) beaches and French Riviera are a couple of hours drive away. There are a number of popular 'river beaches' much closer by and they are popular sunbathing spots. Better still, less than a 30 minute drive away in Monteux is a brand new waterpark that the kids will love. The nearest airports are Avignon, Nimes (both less then an hour from the house) and Marseille (a bit more than an hour). Cairanne 1.5km.St. Cecile les Vignes 5km. Orange 15km. Vaison la Romaine 15km. Chateauneuf du Pape 27km. Avignon 48km. Nimes 70km. Aix en Provence 112km. Marseille 135km. Cairanne has a good general store, baker, newsagent, bar-tabac and a good little restaurant. Only 4 km and you are in St. Cecile Les Vignes - 2 supermarkets, pharmacy, a wider range of shops and the nearest bank and cash machine. Good market every Saturday Morning. 15km to Vaison la Romaine: Steeped in history, Roman remains including a theatre. One of the biggest and best-known markets in the area on Tuesday mornings. Big supermarkets just outside town, DIY places, garden centres etc. Lots of cultural activity in Vaison, including a dance festival in July. The life of the countryside here is actually surprisingly lively. Pretty much every village has a 'Fete du Vin' and some of them have Fetes of quite a lot of other things as well. There is always a garage sale somewhere if you fancy some French tat for a change instead of the home-grown stuff - and just occasionally a gem. There is lots of musical entertainment - for example locally an excellent series of concerts ''Jazz dans les Vignes'. If you need something more spectacular, there are performances of big name operas (stuff like AIDA) in the Roman amphitheatre in Orange. Tickets cost (are you sitting down?) from €50 to €150 - bring your own cushion and an umbrella in case it rains. Of course this is wine country so Caves for tasting and buying wine are everywhere. Cairanne now has the appellation 'CRU- Cotes-du-Rhone Village" villages, which means that the wine is recognised as being on of the top "Cotes-du-Rhones" on a par with Chateauneuf du Pape and nearby Gigondas. The area is also full of restaurants of course. A three course menu costs anything between €15 and €150, depending on whether it is lunch or dinner and how posh the place is. Around € 30 average.